Also I need to somehow keep the clean and dirty elements of the room separate. Ideally I'd like to do the ironing in here too (just about space based on our current kitchen). I hate the idea of you dealing with your laundry in the walkway section. It’s bound to be dirty no matter how you deal with mud and boots at the door end and you’ll be cursing every time those tangled shirt sleeves drop onto the floor.You don’t give dimensions but is there any chance you could position the washer and dryer (stacked) at 90 degrees to the obvious so their backs are to the loo end rather than sides. 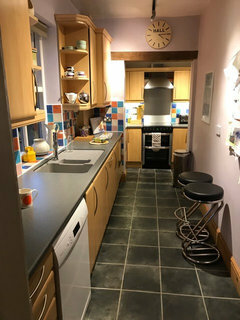 That would leave you with loading/unloading/ironing space where the worktop is currently shown. 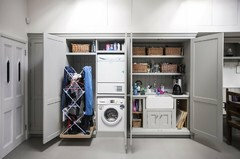 If you need more laundry storage space you could then build some in at the opposite end of the worktop space. And if you don’t, then switch ends and put coat/ boot storage at the loo end and washer etc at the other. For anyone who interested - this was the idea I threw in... Using the space in a slightly different way !! A. Multipurpose kids play room / guest room with bed option either as Murphy bed or sofa bed - with plenty of storage for toys etc (if this is currently a kitchen - with higher level window - suggest replace window with lower one to match the opposite window in B ) also - if kids not too small - could keep a vanity sink in here for guests - if this was the kitchen. (If you need bigger play room - suggest maybe knock into garage too - but keeping front third of garage as garage still for garage type stuff. Subject to structural /fire regs etc of course ) B. One child's room with built in wardrobe C. Second child's room with built in wardrobe D. Hallway entrance with cupboard storage (pink ) on both sides - suggest new double glass doors opening into new dining room and extension at end of hall. E. Family bathroom . Pink cupboard opposite door for towels / bed linen /loo rolls and cleaning products etc . (Smaller pink closet for tanks if needed ?!) F. Master ensuite shower room . ( if no window possible - swap loo and basin location as neater to see basin first, not loo - but good to have natural light for shaving etc near window ! ) G. Master bedroom - with new window and glass door way through to garden access ( as fire escape - but also good for security as you can see anyone trying to access back door ) with his and hers walk in closets . TV on bottom wall. (Will need structural engineer to approve spans etc ) H. Formal dining space - or could be used as secondary snug if formal dining not required . Add side window. Consider making existing opening wider, so view into kitchen possible from front door. ( if structural engineers allow ) I. Glass roofed open porch area - ideal for outside storage /extra drying space / log store etc etc . 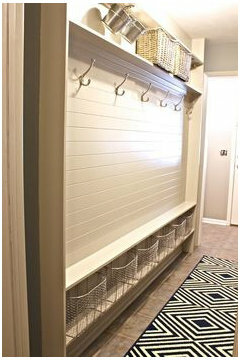 Together with combined mud room / boot room / laundry room - access too and from outside and access point into kitchen. Could also be used as extra pantry storage too. J. Kitchen area - suggest island prep and pretty much everything area with tall cabinets flanking USA style FF and at end of hob run for max storage - DW on end of island nearest laundry room to be least invasive to kitchen flow. L shaper bar gives views of garden and is better for conversation than one long run. K. Lounge area . Can be two sofas - or one with pair of swivel chairs on garden side - remember to leave plenty of room to walk round - you don't want it feeling cramped - anchor sofas on large rug to help keep them in place and to provide comfy floor seating too. Could have extra (toy) storage all down the bottom, TV wall if you want ?! So that's my idea - I hope you like it ! It provides all you asked for I think - keeps the bedrooms together - I can see the children (if small) spending more time playing in the extension, rather than the multipurpose room to be honest - but if older they will relish the space away from direct view of parents. So they will grow into it ! If you need to grow the house again in a few years then maybe stairs could start off in larger built in closet to minimise disruption . An electric towel radiator would be a great option for drying clothes. I would recommend going with something with plenty of surface area to increase drying space and heat output. It might be easier to dry clothes on a wide and lower design model like our Shorty model (as pictured), rather than a tall thin one (especially if you are trying to get the kids to help!). All of our ladder-style towel radiators are available in electric versions. I would also recommend a ceiling suspended clothes airer or &quot;creel&quot; as we call them in Yorkshire. We have one at home and it is invaluable in the winter. 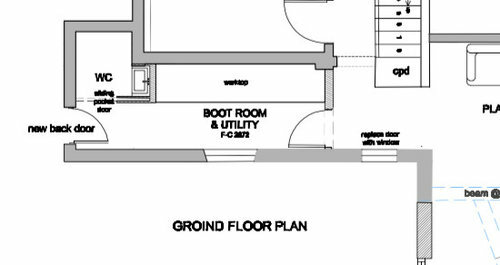 id agree with temple 274, the house we rented once (and my mother in law’s house too) had a similar lay out, utility/bootroom off the kitchen (no wc) leading into the garden in the very urban Surbiton. There still was still mud on the floors as sometimes we would not take the shoes off if needed to grab something quickly from the boot room, sink was always filled with gardening gloves and tools, no clean surfaces for the washed or dried laundry to take out/fold. 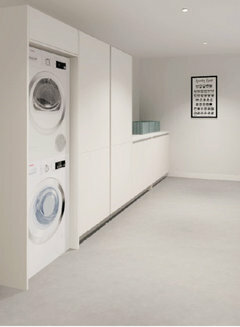 There is also a (windowless) pantry and a small room upstairs (about 1.5 m ) that could maybe be for the clean laundry. I hang a lot of washing outside so wasn’t keen on having an upstairs laundry though (plus worried about leaks and noise). So I keep coming back to this combined space! Just a brief suggestion that you might want to try one of these. We have one and it’s brilliant. There are a lot of this type of arrangements on Houzz (I think Karen@One Plan designed something similar too). 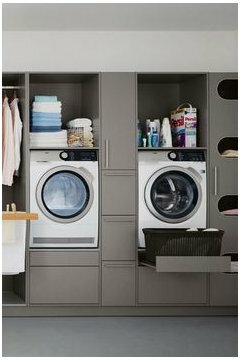 I like the idea of raised washing machine and drier but wonder if this set up wouldn't make the whole unit shake and shudder. - maybe instead of a sink in the loo, turn the sink 90 degrees and have it larger and dual purpose - for hand washing after loo visits and for cleaning off mud etc. - what’s the heat source? A small heated towel rail is very useful for wet kit - if it’s electric you can turn it on and off as needed. Or hooks above a radiator, but again it’s useful if the rad is electric or dual fuel. Did you want a shower? Just thinking, that there is more than enough room for one by the W.C area, if you move the new door. Dimensons would help too. We have helped clients overcome similar scenarios and obstacles. Below are 2 examples of solutions. Thanks for the mention Luciana ! Yes we often design raised laundry appliances - set on an anti vibration mats to help keep things calm when the appliances are on spin ! There’s some examples on our pro page ! Hi Jen. It's quite hard without exact dimensions but I would do something like pic one but with the sink "exposed" at the wc end of the room like in pic 2. 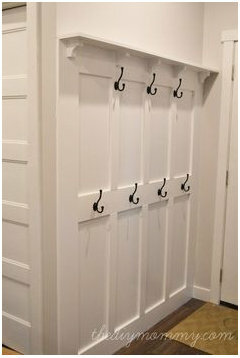 One cupboard : ironing board and stacked clean and muddy laundry baskets, then a pull out clothes airer (with ventilation holes in the door) and then stacked washer and dryer with a pull out shelf between them for loading/unloading. I'd keep the cabinets light given the space. Just counting tiles I think you have room (and be able to access the cupboards!) 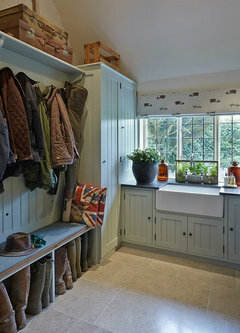 for a narrow bench with boot, shoe, brolly storage underneath on the window wall and then coat hooks above (you may also be able to fit a long radiator under the bench). 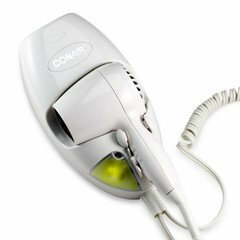 You can buy portable washers for the dog and boots, although the one on the link has hit and miss reviews and you could also consider attaching a hairdryer on the window wall if your dog goes near them?! Washable mat by the door, boot scraper outside and I'd go for LVT on the floor. So have the plans gone through to extend the garden room? Exciting! All really excellent ideas thanks. Especially like the portable dog/boot cleaner. Plans for double storey extension finally been approved and layout all sorted. Currently our kitchen is far too small, and our hallway is full of mud and ‘stuff’. Very frustrating but also good to appreciate the issues that need solving I think! Wow Jen, exciting times coming in 2019! What style of furniture will you choose? 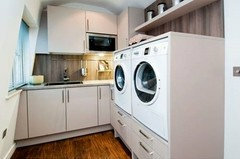 Raised washer and dryer with pull-outs underneath to take laundry baskets, as in the Pinterest photo above. But the big one - tanked floor, like a wetroom, to a central fast flow floor drain, and a hose with shower attachment on it, controlled by a mixer tap. You can literally hose things down in the room - dogs, wellies, stubborn children. 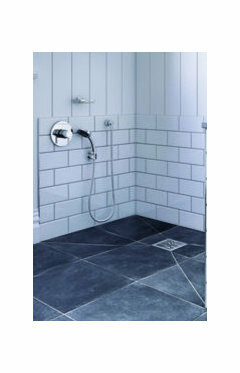 Thinking about this further, I'm considering making the WC a wet room, with shower on wall and drain in floor, where we can hose down dog/wellies etc. The main part of the utility room is 1.75x3.5 roughly. Will get some tough entrance matting by the door. That will leave room for some tall units for ironing board/hoover etc, plus sink and work surface. Then on the left a cupboard for coats, and a bench under the window. Might all be a bit of a squeeze though!